We offer a comprehensive range of treatments for common and uncommon eye conditions. We also make 90% of our own lenses. Based in Harley Street, Barnet, and Wealdstone, we can ensure your eyes are giving you 20/20 vision, and detect early warning signs of diseases and conditions. Get in touch today, with Visioncare Medical Eye Centre specialist opticians London and keep your vision healthy. Plugs were installed into my VERY dry eyes. I have great relief in numerous ways. No more dry or red eyes. No more spending about £20 per month on eye drops. I am very happy. Worth the investment. I am very happy with Mr Rugani and Visioncare! "I have been coming here for over ten years.... the staff are so friendly and I know I receive the best possible care here... I could not sing their praises loud enough." "Visioncare helped me benefit from the Ortho-K treatment in their usual professional...Now I enjoy being glasses free better than 20-20 vision! I was glad I opted for Ortho-K instead of any laser treatment, and equally glad I chose Visioncare... By my experience, I would highly recommend both!" Dry eye syndrome is a condition where your eyes do not make enough tears. Tears in the eye act as a lubricant and protect your eye from the environment. Sufferers of the dry eye condition often experience inflammation and soreness. We specialise in treatment for dry eye syndrome and have a range of options to keep your eye moist. Visit this page for more information. The knowledge that our cornea lenses can be reshaped using contact lenses is not new. It was first tried forty years ago. Sadly, the technology was hit and miss. Happily that has now changed. Using the latest 3D corneal mapping technology and special contact lenses, we can offer a service whereby your vision is corrected while you sleep. You simply ware the lenses why you slumber, remove them in the morning and enjoy 20/20 vision all day. Ortho - K offers a viable alternative to laser eye surgery, as well as providing the same freedoms. It is also suitable for children. Learn more about Ortho – K here. Around two million children in the UK experience learning difficulties. It is estimated that half of these children are suffering with a condition called scotopic sensitivity syndrome. This disorder affects vision, making reading and writing difficult. It is also known as perceptual dyslexia. It is caused as a result of inappropriate brain-eye co-ordination. In essence suffers have difficulty reading due to the relationship between light and their central nervous system. At Vision Care Medical Eye Centre London opticians we provide specialist examination and treatment services for children with this condition. One of the children we treated was featured in a BBC NEWS Online story. Prior to treatment, Ben, aged 13 had considerable difficulty reading. He received tests for dyslexia which proved inconclusive. Following an eye test, we treated Ben using coloured filters held in place using eye glasses. Ben's reading improved overnight and he took two GCSE's a year early. It is tragic that so many children can be helped with a simple eye test and yet are not. If you feel your child maybe suffering with scotopic sensitivity syndrome, get in touch and make an appointment. This could be exactly what they need. Visioncare Medical Eye Centre specialist opticians in London provide award winning eye health services that will ensure that your eyes are as healthy as they can be. We offer a comprehensive range of eye treatments administered by experts in their fields. 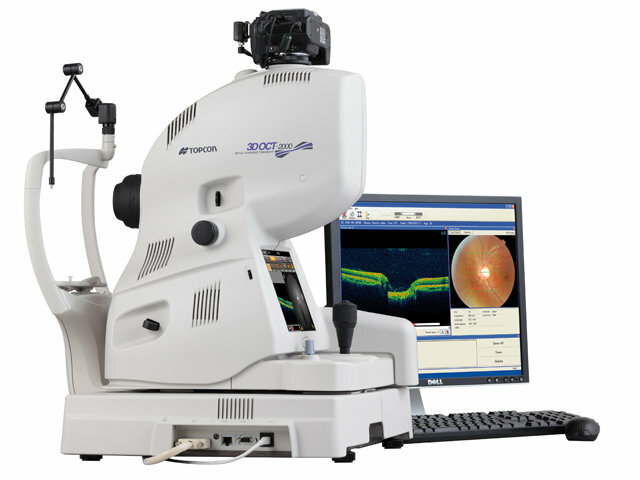 We use the latest technology and techniques to ensure we provide you with your optimal visual results. Few people realise that many illnesses and conditions can be discovered and treated through better eye health. This is why we have invested in an Ocular Coherence Tomography (OCT) machine. This state of the art and clever device provides a detailed 3D image of your eye. Using this machine we can detect and catch conditions such as diabetic retinopathy, age related macular degeneration (AMD), and glaucoma.